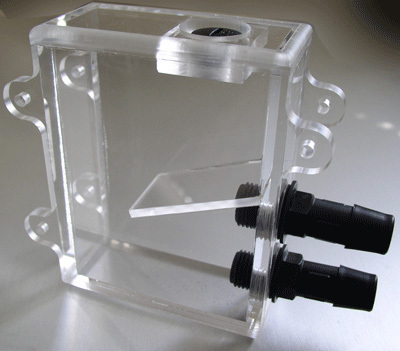 The patent pending MCRES-MICRO is a small form factor reservoir designed to operate quietly and reliably with high flow pumps. The patent pending design features an angled baffle forcing the turbulent flow at the bottom of the reservoir. This allows it to function without air entrainment at low fluid levels and affords extended usage without refills for approximately 2 years.